Daniel March is an exciting new face taking his place amongst the independent soul music movement. The first single ‘Magic’ from his latest release is a breezy, intoxicating slice of pop-soul produced by Daniel and Simon Cohen (Justin Bieber, Guy Sebastian, Jessica Mauboy) that will be accompanied by an animated video by Isaiah FiftyFour Design in London. Splitting his time between London and Sydney, the well-respected multi-instrumentalist has been honing his craft working with the likes of Grammy nominated singer, songwriter, and MC, Maimouna Youssef aka Mumu Fresh (The Roots, Common), Chantae Cann (best known for her work with Grammy Winners Snarky Puppy and Foreign Exchange), Jordan Rakei, Wallace, Thandi Phoenix, Young Gun Silver Fox’s Andy Platts and rising UK star Tiana Major 9 to name but a few. Daniel’s organic early recordings took place in Atlanta, Georgia USA alongside the likes of Khari Cabral Simmons (Donnie, India Arie), acclaimed songstress Julie Dexter and Bugz In The Attic’s Daz-I-Kue but it was his 2015 single ‘Nina’ that saw him mentioned as one to watch in soul circles. December 2017 saw the release of 'Falling For You' and a remix by Ashley Beedle through Ramrock Records. 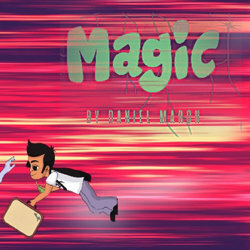 ‘Magic’ is a breezy, intoxicating slice of pop-soul produced by Daniel March and Simon Cohen (Justin Bieber, Guy Sebastian, Jessica Mauboy) that will be accompanied by an animated video by Isaiah FiftyFour Design in London.